The Jade Liqueurs® Online Boutique was created to satisfy the needs of the absinthe connoisseur, and offers only the finest absinthe accoutrements and objets d'art. We invite you to check back periodically, as we will occasionally make additions to our product offerings. 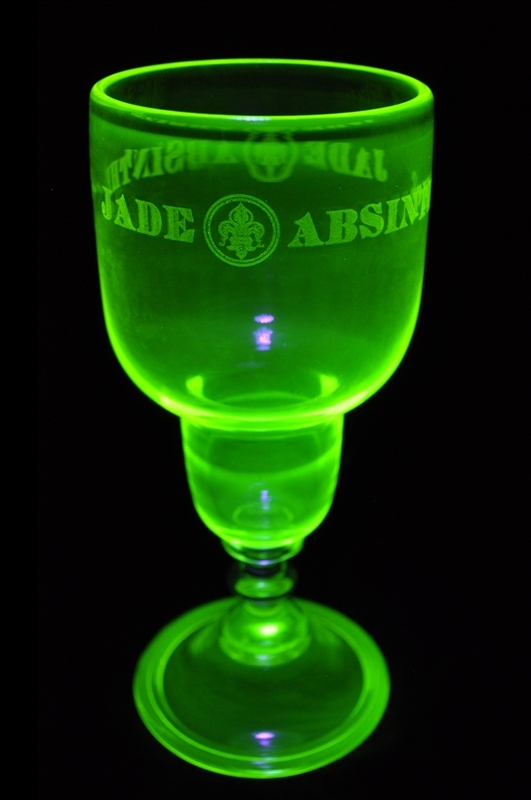 Description: Jade Liqueurs® is proud to introduce a rendition of what is perhaps the rarest and most desirable absinthe glasses, which are those made from ‘uranium glass’. Uranium glass is glass in which uranium, usually in oxide diuranate form, is added to a glass mix before melting for coloration. Uranium glass became popular in the mid-19th century, with its period of greatest popularity being from the 1880s to the 1920s. It was during this time that the uranium absinthe glass was originally introduced. Due to limited production and breakage over the years, original uranium absinthe glasses are extremely rare and highly sought after by collectors. Jade Liqueurs has teamed with Bonnecaze Absinthe & Home and a renowned glassworks artisan to produce this truly one of a kind Reservoir-style absinthe glass. Like the Jade absinthes, this limited edition absinthe glass is painstakingly handcrafted in the same material as the coveted originals, and features 19th Century stylistic elements. Each glass is individually laser etched with the Jade Liqueurs logo between the words "Jade Absinthe." As with the originals, each glass may vary slightly from one to another. The Jade Liqueurs® uranium Reservoir glass is ready for immediate shipment. 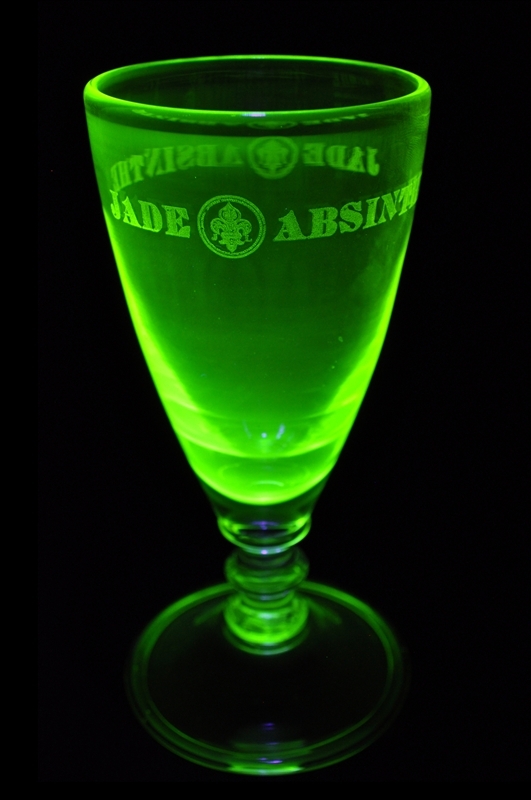 Description: Jade Liqueurs® is proud to introduce a rendition of what is perhaps the rarest and most desirable absinthe glasses, which are those made from ‘uranium glass’. Uranium glass is glass in which uranium, usually in oxide diuranate form, is added to a glass mix before melting for coloration. Uranium glass became popular in the mid-19th century, with its period of greatest popularity being from the 1880s to the 1920s. It was during this time that the uranium absinthe glass was originally introduced. Due to limited production and breakage over the years, original uranium absinthe glasses are extremely rare and highly sought after by collectors. Jade Liqueurs has teamed with Bonnecaze Absinthe & Home and a renowned glassworks artisan to produce this truly one of a kind East/Chopes-style glass. Like the Jade absinthes, this limited edition absinthe glass is painstakingly handcrafted in the same material as the coveted originals, and features 19th Century stylistic elements. Each glass is individually laser etched with the Jade Liqueurs logo between the words "Jade Absinthe." As with the originals, each glass may vary slightly from one to another. The Jade Liqueurs® uranium East/Chopes-style glass is ready for immediate shipment. 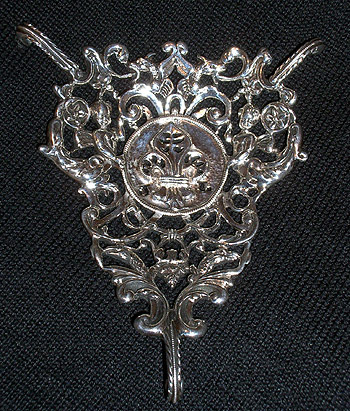 Description: The Nouvelle-Orléans Grille is cast in solid sterling silver, and consists of an intricate floral design with cherubs, which matches the label artwork for our distinguished Nouvelle-Orléans absinthe®. At the center of the piece is a hand-carved medallion which represents the Jade Liqueurs seal. Each casting undergoes additional hand detailing that results in an exquisite piece, suitable for the most discriminating collections. This grille is designed to suspend a lump of sugar inside of larger absinthe glasses. The Nouvelle-Orléans Grille is also offered in solid 18 karat gold (please inquire). Each piece is made to order, so please allow 2-3 weeks for delivery. 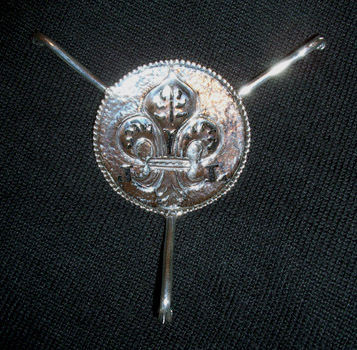 Description: The Our Jade Grille is cast in solid sterling silver, and is remniscent of the most popular grilles used during the Belle Epoque. At the center of the piece is a large medallion which represents the Jade Liqueurs seal. Each casting undergoes additional hand detailing that results in an exquisite piece, suitable for the most discriminating collections. This grille is designed to suspend a lump of sugar inside of larger absinthe glasses. The Jade Grille is also offered in solid 18 karat gold (please inquire). Each piece is made to order, so please allow 2-3 weeks for delivery. The designs used for the Nouvelle-Orléans Grille and Jade Grille are the exclusive property of Jade Liqueurs and Kirk Burkett.